Clipping Chix: SavingStar: FREE Nutella & GO!® 1.8 oz. Loadable Coupon! 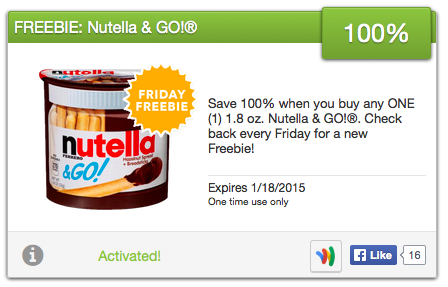 SavingStar: FREE Nutella & GO!® 1.8 oz. Loadable Coupon! store and pick one up and earn 100% back to your account. Save 100% when you buy any ONE (1) 1.8 oz. Nutella & GO!®.